Winchester Blind Side combines ground-breaking, stacked Hex Steel Shot Technology and the Diamond Cut Wad in the most deadly waterfowl load available. Loaded with 100% Hex Shot, hunters get more pellets on target, a larger kill zone and more trauma inducing pellets than ever before, meaning faster kills. 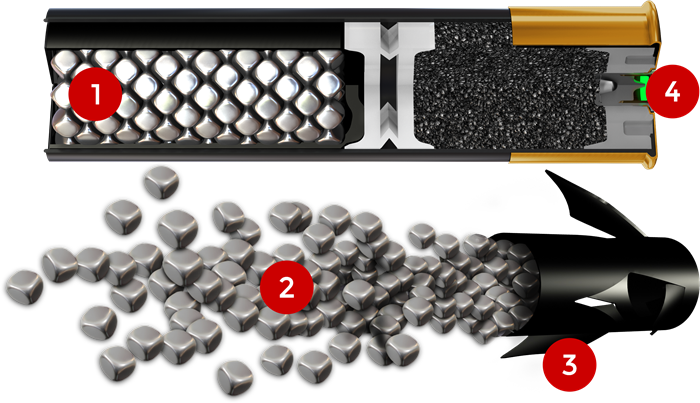 The six-sided, multiple-edged shot provided increased trauma and wound channels, while the Diamond Cut Wad is designed to help with consistent patterns and increase kill zones by up to 25%. Also included is the Drylok Super Steel System, which keeps the powder dry. This system seals out water and moisture for improved patterning and consistent velocities.